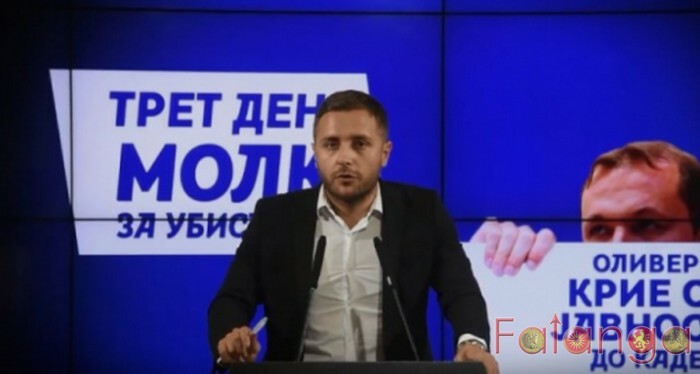 VMRO-DPMNE spokesman Dimce Arsovski said at Wednesday’s press conference that it was the third day that Oliver Spasovski was silent about the details of the case of the murder of 21-year-old boy Nikola Sazdovski-Sazdo..
“Who is the third person who participated in the murder and why he has not been arrested yet? Is the government hiding him or seeking a channel for his escape from the country? Is that why there is still no international arrest warrant and why his photograph has not been released in the public to report him if someone sees it? Is the same scenario as the escape of the killer of young footballer Martin Janusev, who was killed in front of his home, underway? Was there a fourth person in the car with which the killers came? Who is that person and why is there no report for aiding it? Who are the inspectors who qualified the murder as violence? By whose order they qualified this brutal liquidation as a lucrative act, and not as a murder that is in fact? Why are there no actions against them? “Arsovski says.